The aspiring artists among us will certainly nod knowingly at the mention of the BP Portrait Award, an annual showcase open to young portrait painters worldwide. While we wait with baited breath to see whom amongst us will enter 2014’s competition a question springs to mind. What is the National Portrait Gallery up to in the meantime? Why, it is the photographer’s equivalent! Until February 9th 2014 one can enter the realm of the Taylor Wessing Photographic Portrait Prize and view firsthand Spencer Murphy’s winning image KATIE WALSH. Murphy success is unprecedented: this is the sixth consecutive year his work has adorned the walls of the NPG. 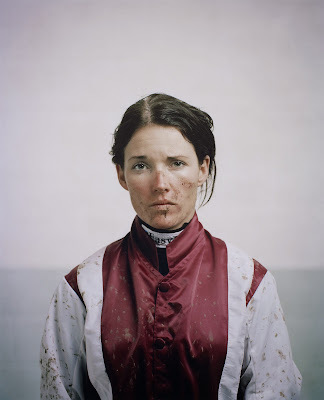 Commissioned for a poster campaign intended to promote Channel 4’s coverage of the Grand National, Murphy had approximately thirty minutes for this shot of Katie Walsh. Then about twenty-four hours of nail-biting anxiety as he waited for this image captured with a large-format film camera to develop. For anyone slightly bemused at this image just remember. The Brits do like a good Horse race, not to mention the betting that goes along with it. The mud spattered across jockey Walsh’s face and silks is the result of racing in Kempton Park on a particularly wet and windy day. Also enduring extreme diets and sporting injuries Walsh is considered the leading female jockey. Last year she claimed the best Grand National finishing time for a woman. Ever. Murphy captures her strength of character in this almost intrusive image… but also something softer. Perhaps it is the way her hair threatens to fall loose, or the lift of an eyebrow that really forces milling tourists, married couples and arty students alike to stop. And just look. What was your reaction? Want to see more? Here’s his website. 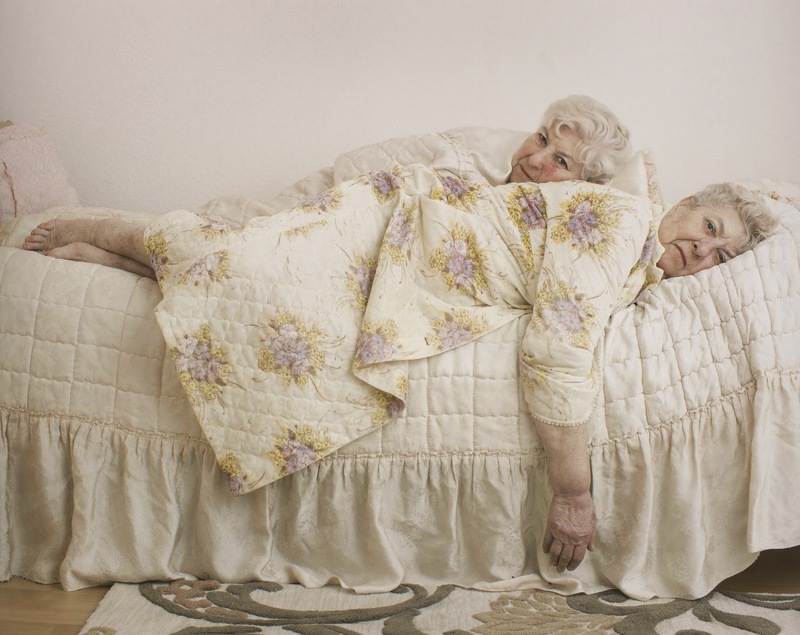 This photograph, THE TWINS, by Dorothee Deiss came in at fourth place. Please forgive the equestrian commentator’s echo. Its time to take a closer look at the relationship between these Russian-born twins Esther and Ruth. They appear here, aged seventy-five, in their bathrobes. Certainly not something they had expected when they met the pediatric endocrinologist Deiss at a bat mitzvah earlier this year. Deiss’ gift is clear: she has coaxed complete strangers from an elder generation to throw decorum out the window and reveal the tenderness and strength of their sisterhood. 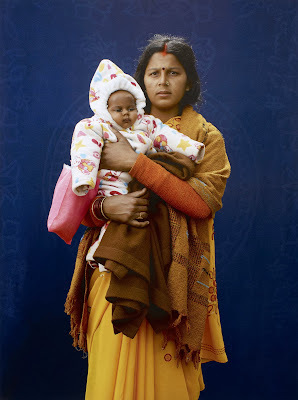 Entitled KUMBH MELA PILGRIM – MAMTA DUBEY AND INFANT it was taken in a pop-up studio at the annual Kumbh Mela pilgrimage in India. What do you see? A humorous contrast between the mother’s traditional Indian dress and her child’s western all-in-one… or something more sinister? The combination of blue backdrop, prominent in Christian iconography, and Madonna and child-esqu arrangement jars with the sitter’s Hindu beliefs. Like the winning work this is a commissioned piece. With only a three-minute window to capture this Abrar gained third place. 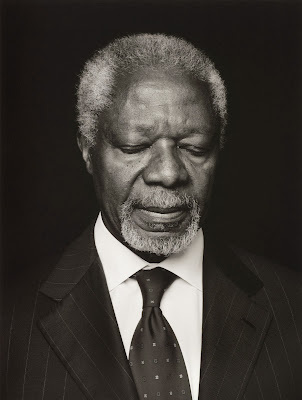 As the former Secretary-General of the United Nations the sitter, Kofi Annan, is high-flying to say the least. So scroll back up to the photograph again. What do you notice? Annan has his eyes closed. Abrar has revealed that an initially reluctant Annan ‘didn’t want to do it’. But through this the photograph has an unparalleled intimacy. As the viewer we feel that we are intruding on a private moment of a man very much in the public eye. The simplicity of the black and white radiates integrity. And after that its back to the BP Portrait Award!